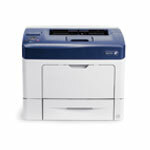 Produce professional-looking documents quickly with the Xerox Phaser 3610 monochrome laser printer. You?ll get best-in-class speed, expanded capabilities and crisp print quality for your busy office. Fill out your information below to contact us.